In a large bowl, mix the oatmeal with the coconut, almonds, oil and honey until all ingredients are thoroughly combined. Spread the mix out on a baking sheet and stir occasionally with a wooden spoon until the granola is crunchy and golden brown, for about 20 minutes. Once cool, add the cranberries and peaches. 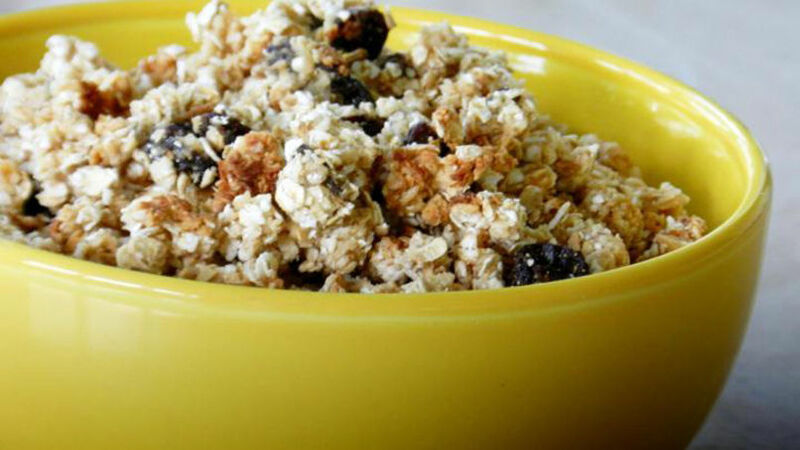 Mix to combine with the granola. Serve immediately with fresh fruits and popcorn (and milk or yogurt). Once completely cooled to room temperature, store in airtight containers. Refrigerate for up to 1 week. You can make different kinds of granola using dehydrated fruits such as mango, pineapple, banana, raisins, dates, and pieces of chocolate, any kind of nut, vanilla extract and Stevia in place of the maple syrup, agave nectar or honey. Afterschool snacks don’t have to be super fancy or complicated. On the contrary, the best snacks are light and wholesome for sharing and enjoying before getting started on homework or playing outside before dinner. Below, I've included some filling snack ideas that are super quick and easy to put together so you always have a few options on hand.